Watch out! The ball is coming right onto you! Join the wild beasts of the jungle as they throw their own Football party. All these fun fiestas are happening only on Hot Shots Slot. This sizzling release by iSoftBet is enough to send waves of excitement through your veins. Grace your online gameplay with this outstanding slot game and be sure to join the match! Who knows, you might end up getting up some fun prizes in the end! Hot Shots Slot is quite easy to play. You simply need to set up your desired bets and then click onto the spin button to start the fun. Three or more matching symbols that line along a pay line award you a win. Of course, features are here to help increase your wins. Try to activate them by obtaining the required symbols. Talking about symbols, you can come across symbols such as cockerel, bulldog, bull, big cat, Bear and high-ranking card symbols such as A, K, Q, J, 10 and 9. Want to know more about the bets? Here they are! Bet Levels: Hot Shots Slot does not offer any Bet Levels during its gameplay. Amount of Paylines Selection: Watch out! Hot Shots Slot offers 243 ways to win. These ways to win are always active and there is no option to change that. Be covered for the wins on every spin! Coin Values: You get to choose from a minimum of £0.25 up to a maximum of £125.00 per spin. To do this, simply click onto the plus and minus buttons onto the user-interface tab at the bottom of the screen. Once you are good to go with the spin, click Spin! The Red Ball with the wordings, WILD onto it is the Wild Symbol of the game. It appears exclusively on reels 3, 4 and 5 and can replace any other symbols of the game except for Scatters. When you hit one on the reels, it can expand to fill the reels horizontally as well as vertically. This increases your chances of generating wins. 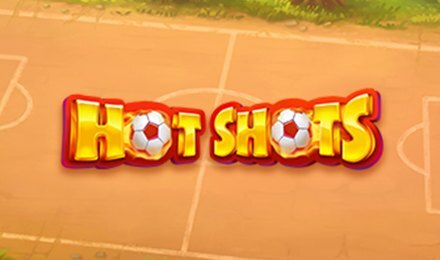 Hot Shots Slot Logo is the Scatter Symbol of the game. It is mostly used to activate the Free Spins Feature of the game. Hit three or more Scatter Symbols to activate the Free Spins Feature. Based on the number of Scatters you’ve used to activate the feature, you will be awarded free spins. To note, you can get a 3x multiplier and can expect to have more Wild Symbols during the Free Spins Feature. Good luck for your online match with Hot Shots Slot. Go for the goals!! !